After getting shut out and two-hit by the likes of Gents game whore Junior Guerra, the Dodgers were in desperate need of a good performance today. It actually would have been a great day to lay some money on them. They got a big swing from MVP candidate – you heard me – Corey Seager. 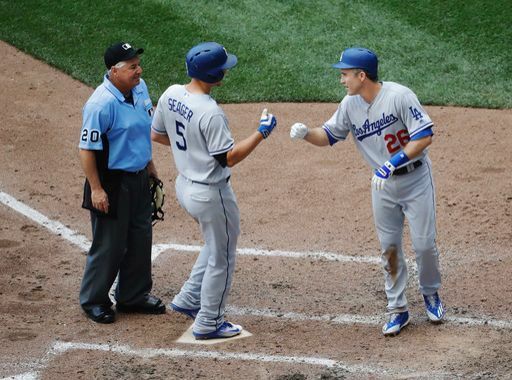 He hit his 17th home run of the season, and the Dodgers won the game 8-1 in Milwaukee. We already covered the wonderful Kershaw epidural news that broke today. The Dodgers also marked this day as the day they added Bud Norris to help preserve their lead in the Wildcard standings. They just need to get back to that magical stadium of theirs on the West coast and let the voice of Vin Scully carry them to some late night wins. With Corey Seager and Vin Scully, anything is possible. ← Previous Story Fuccccckkkkkkk. NOOOOOOOOOOOOOOOOOOO.